I'm trying to upgrade my ESX 4.1 HP BL460 blades to 5.0.0 or 5.0.1. When I attached the baseline, and scan, it says that it is imcompatible. I tried with VMWARE's own 5.0.1 and HP's own 5.0.0. Same message. have you tried manual update? 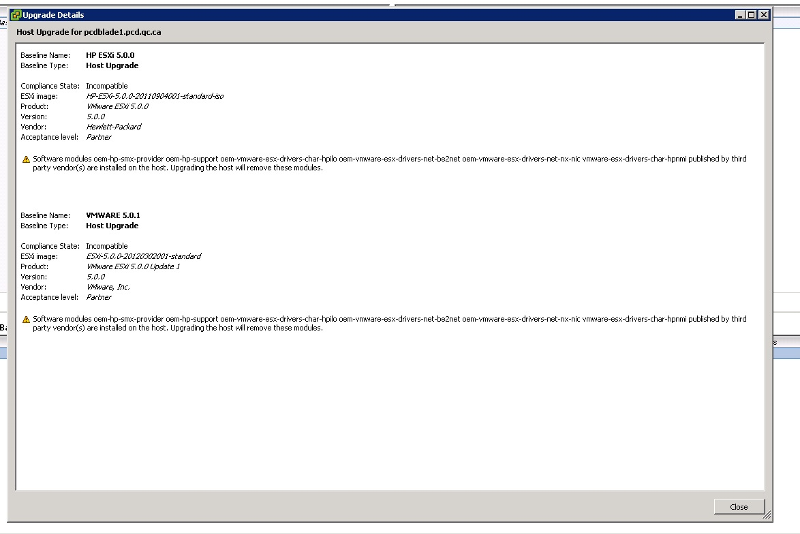 also are you using HP OEM version or VMwares version? What do you mean manual update? With the CD and reinstall? No, I'd better do it with Update Manager since I have a big number of blades. copy the VIB to the server, takes seconds! we can update manually faster than Update Manager!